Size: 43″ neckline, 5.5″ deep. Comments: A bertha of Duchesse de Bruxelles. Raised rose petals in the Point de Gaze inserts. Conventional Duchesse motifs, with a little raised work on halfstitch ground in the strapwork. 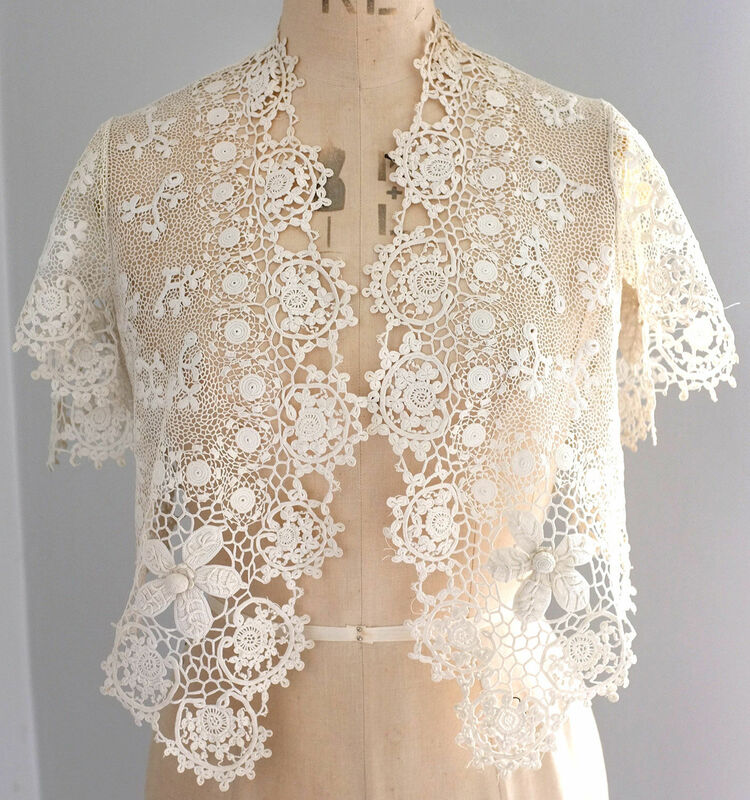 The bobbinlace is a little on the Bloemwerk side in design and execution. Damage: One small break along the neckline, along with one edge place that looks cut and frayed. Minor. Occasional pinhole in the ptdG ground. Soilage: Some localized small red-brown spots, mainly in the needlelace. Sold for 67.20 GBP, 2 bidders. Size: 50″ neckline, 3.75″ wide at ends. Comments: A Brussels Duchesse collar with long lappet front ends. No raised work in the Point de Gaze inserts, but there are some small nice decorative fillings in the needlelace. There’s an interesting center back medallion, a bobbin-made flower surrounded by a ring of Point de Gaze. Interesting raised work on half-stitch bands and leaves throughout. Interesting design with some involved technique. Soilage: Off white color. Red age spotting throughout. Point de Gaze inserts seem a slightly different color than the bobbinlace. Comments: A Point de Gaze handkerchief, no raised work, which is often an indication of better quality design. Such is the case here, note the naturalistic flowers in the open spaces all around the piece. Good decorative ‘mode’ fillings, basically petaled flowers, and the strapwork has a nice has an interesting curled motif. A few esprits in the form of buttonholed rings scattered in the ground. A higher end market piece (but not too high). Further enhanced by the widely spaced looped edge picots, sign of a better manufacturer. Provenance: Note the interesting attached paper indicating a £5-5-0 price! Who knows when that was attached. Damage: A few small holes, especially in one corner of the lace. Soilage: Some light age spots. Finish: Horizontal and vertical fold creases, some wrinkling in the center cloth. Sold for 156.00 GBP, 5 bidders. 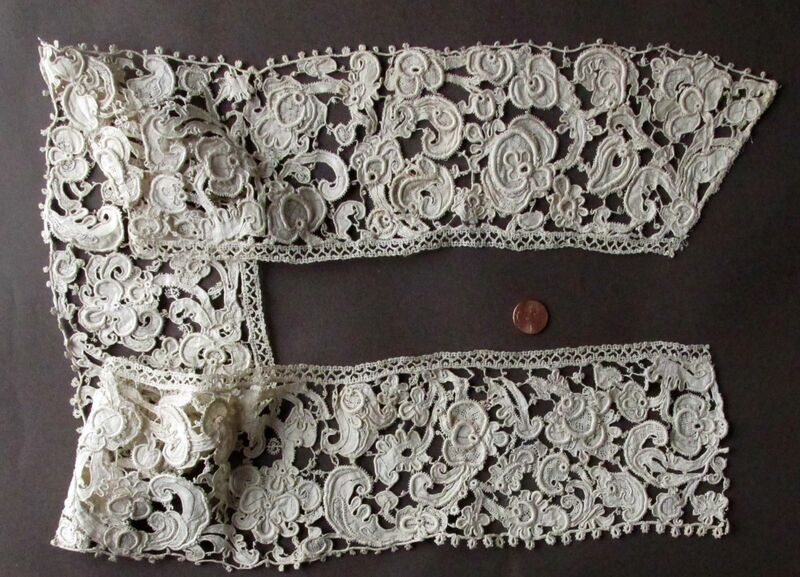 Comments: A lappet scarf of Duchesse de Bruges. Some raised work on halfstitch ground in the strapwork. Note a few ‘islands’ in the irregular picoted brides, more on the Bloemwerk side. Conventional motifs. Looks like there are some twisted pair brides at the ends which seem to be part of the design – unusual. Finish: No obvious creases, but some light wrinkling overall. Sold for 9.00 GBP, 1 bidder. 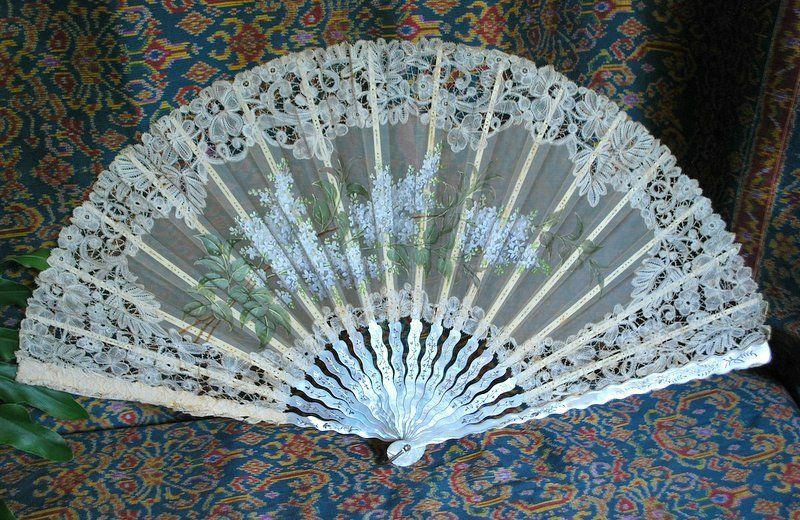 Comments: A Duchesse de Bruges fan with surface carved sticks and pierced sticks. 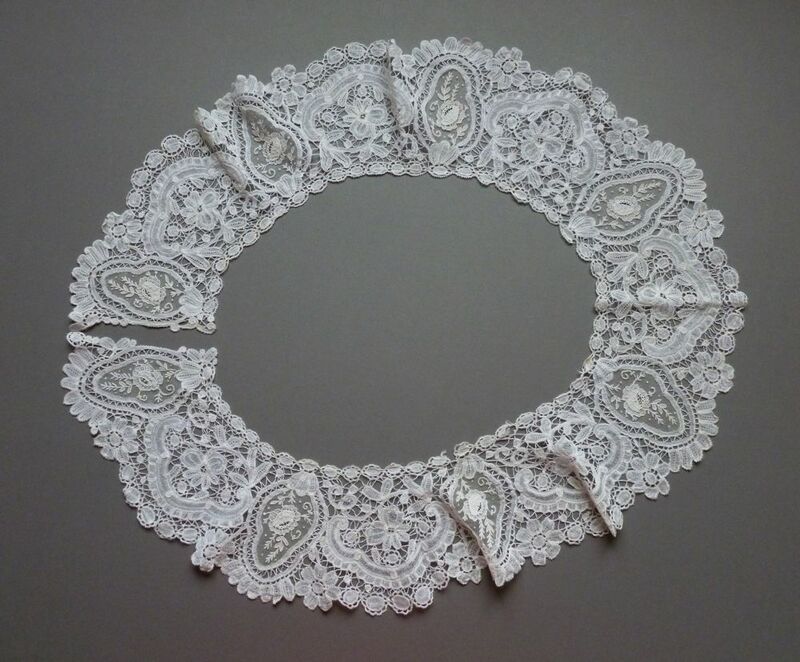 The lace design is a bit more naturalistic than usually found in the Duchesse variations. Some tiny needle-made fillings in some flowers, just a single buttonholed ring. Sold for 82.00 GBP, 2 bidders. Size: 38″ neckline, 76″ outer edge, 6″ deep. Comments: A Point de Gaze bertha with multiple layer raised petal roses. The shapes of the petals are a little flattened, and along with the good decorative mod fillings, this is a higher end market piece. Note the slightly open edges in the non-raised parts of the petals, given these flowers additional relief. The heavy massing of flowers and decoration on the outer edge is quite effective. Soilage: Overall age darkening with a few small red-brown spots. Mesh looks good. Sold for $326.10, 3 bidders. Comments: These two pieces have the same provenance and seller, so I’ll put them together. Seller says the 2nd one is slightly finer than the first. 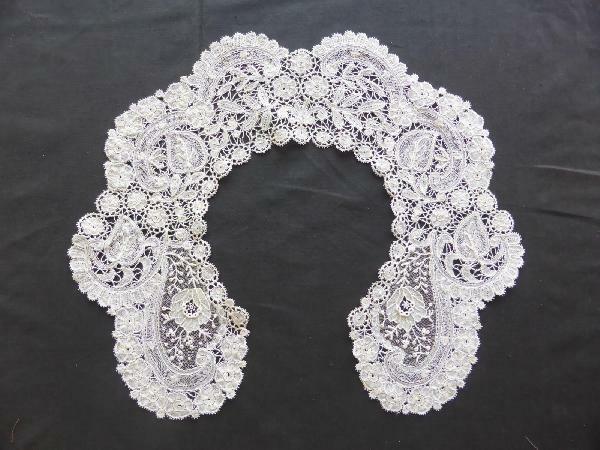 There are many types of Duchesse laces, some including Point de Gaze (Duchesse de Bruxelles), some not (Duchesse de Bruges), both with bobbinlace resembling each other. There are types that start to look more like Bloemwerk. Then there’s the occasional type like this, you can see it in the form of the flowers which seem to go in the direction of Ghent work. 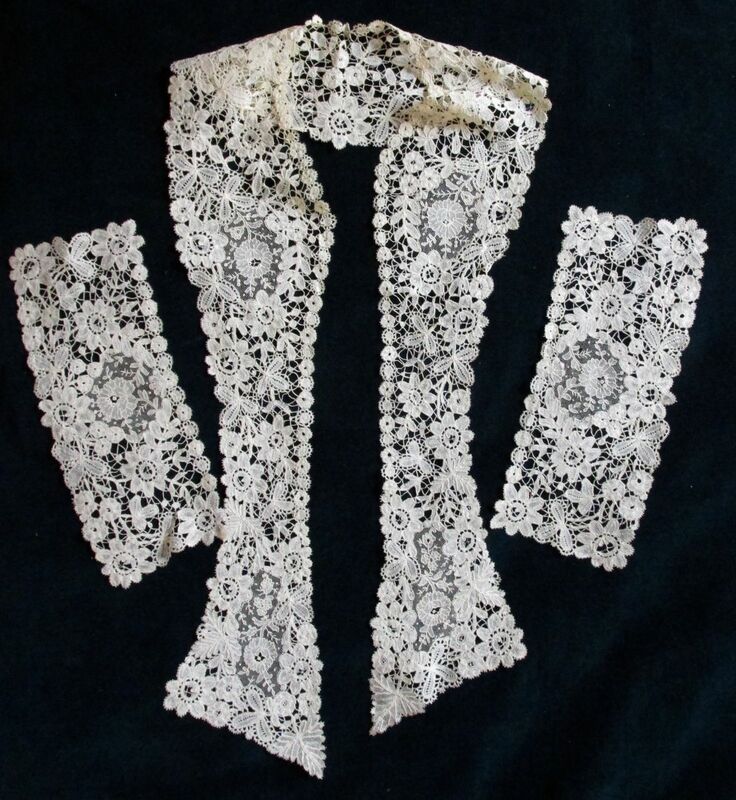 The whole subject is very worthy of research since the Duchesse categories are the most commonly seen laces on Ebay. This type appears to be of the kind taught by van der Meulen-Nulle, who wrote a book on the subject in 1907. 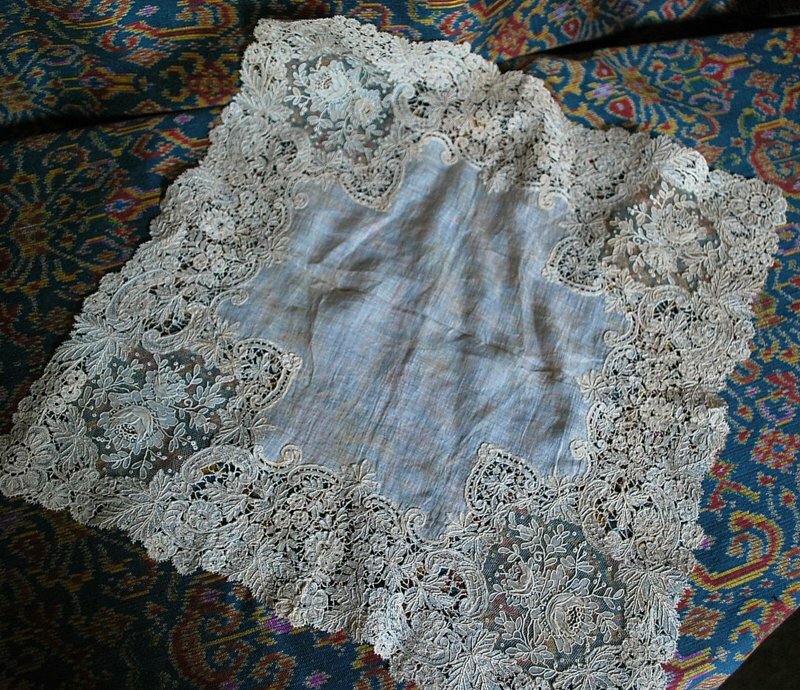 Sr. Judith de Kreijger studied this lace as a girl, and you can see some of her examples in the memorial piece I did at http://tinyurl.com/n5wsysf. The area above the flowers in the listed pieces is rather confused, almost like Honiton snails/slugs style. But they are definitely Belgian pieces. Provenance: This belonged to a Viennese lady who came to England in 1938 to escape the Nazi regime. It had belonged to her mother, who was part of Viennese court society. Modifications: Can’t see the ends on the first piece, Second is cut on both ends. Damage: Seller cites occasional broken bride on both. Soilage: Pale ivory on both. Sold for 30.00 GBP, 5 bidders. Size: Seller thinks it is around a size 10. Comments: A small jacket of Irish Crochet. Given the technique used (heavily padded motifs, unusual raised work, and two varieties of ground), this might be a French piece. It has an almost ‘snowflake’ edge around the jacket and sleeves, with a nicely complementing inner design of small sprigs on a light ground. Excellent technique and design. Sold for 171.00 GBP, 7 bidders. Comments: A Beds fallcap, all trails and tallies. 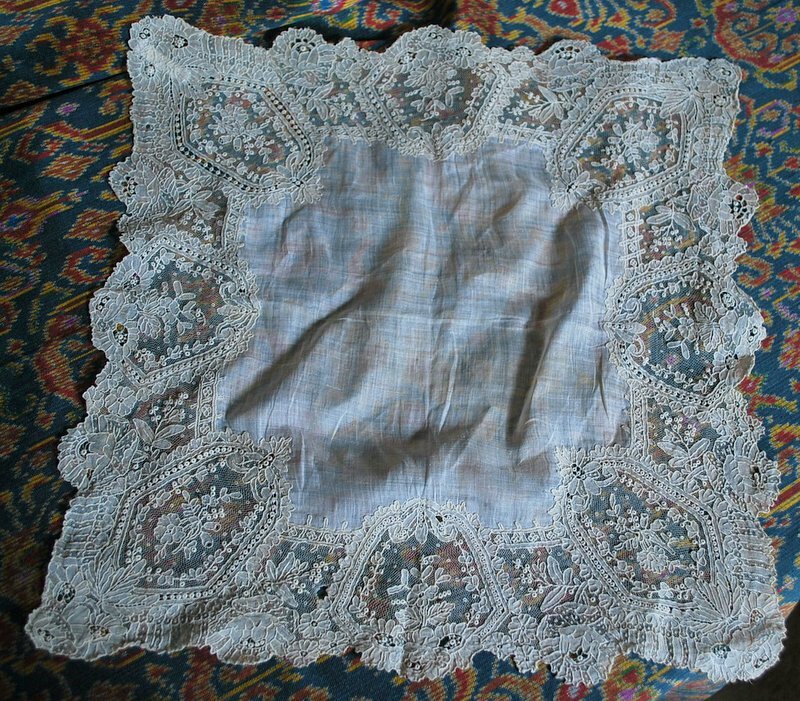 I have a similar handkerchief in my collection, which a reader called a little-known form of Beds. 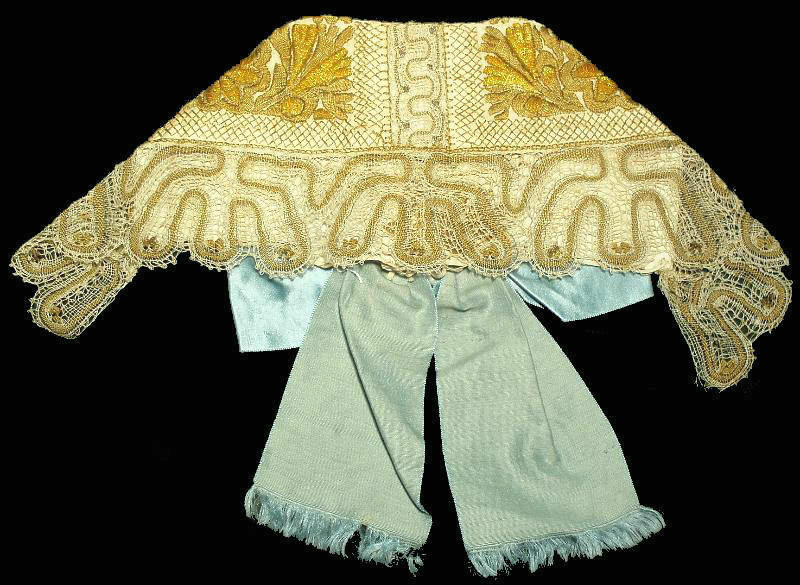 This piece looks complete, often the lappets were made separately and attached later. Sold for 58.80 GBP, 5 bidders. Size: 35 cm neckline, 84 cm outside edge, 9 cm depth? Comments: A small collar of Duchesse de Bruxelles, no raised petals in the Point de Gaze. There are some typical raised rings and a small filling in the needlelace ‘flower’ center. Raised work against halfstitch ground n the strapwork in the bobbinlace. 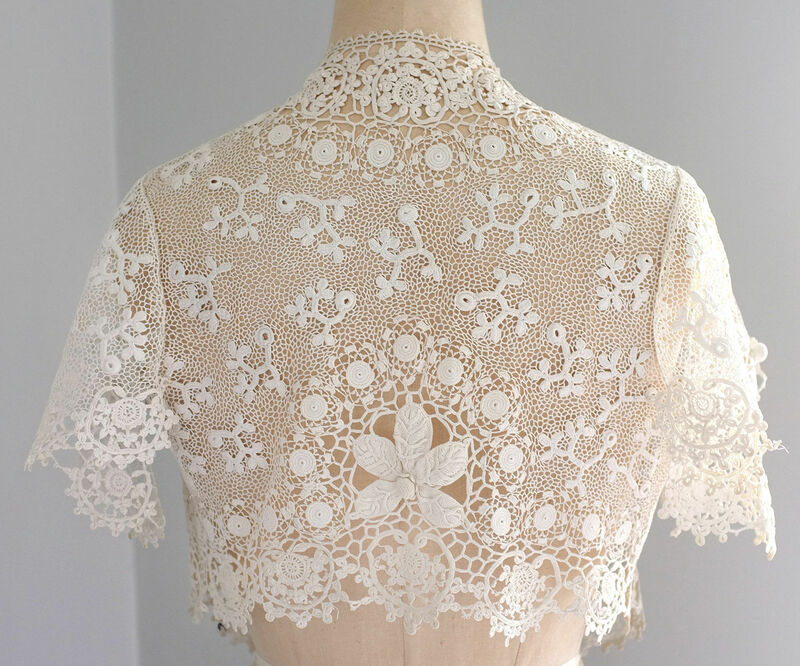 Good leaf work, and I especially like the 6-petaled flowers along the neckline and parts of the outer edge. Neat precise work. Soilage: Seller cites some light spots. Comments: A Duchesse de Bruges fan with a handpainted insert. Mother of Pearl sticks cut in a wavy pattern, with what looks like silver inlays. The lace looks a bit on the Bloemwerk side, with gimp outlines, no raised work, and very simple fillings. But the motifs are not standard to either Bloemwerk or Duchesse. 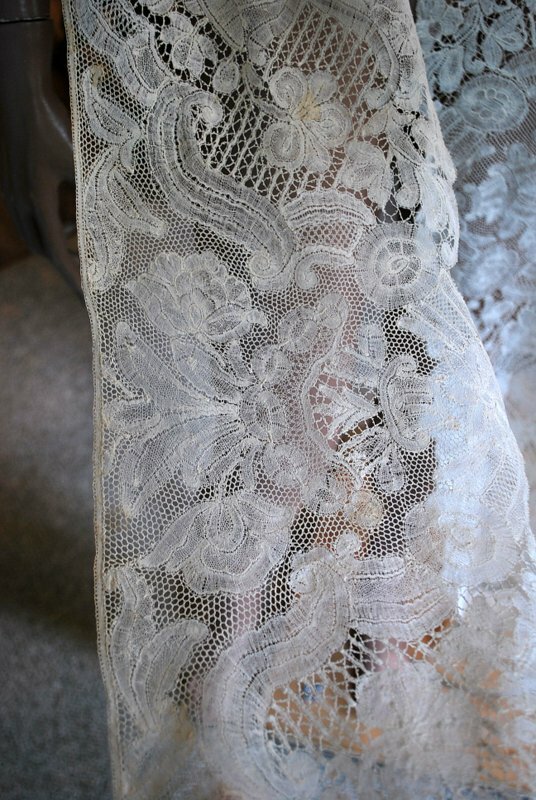 It does look like the lace was made in this form, not cut from a larger piece. Damage: Nothing obvious from the photos. Sticks intact. $102.50, 4 bidders, reserve not met. 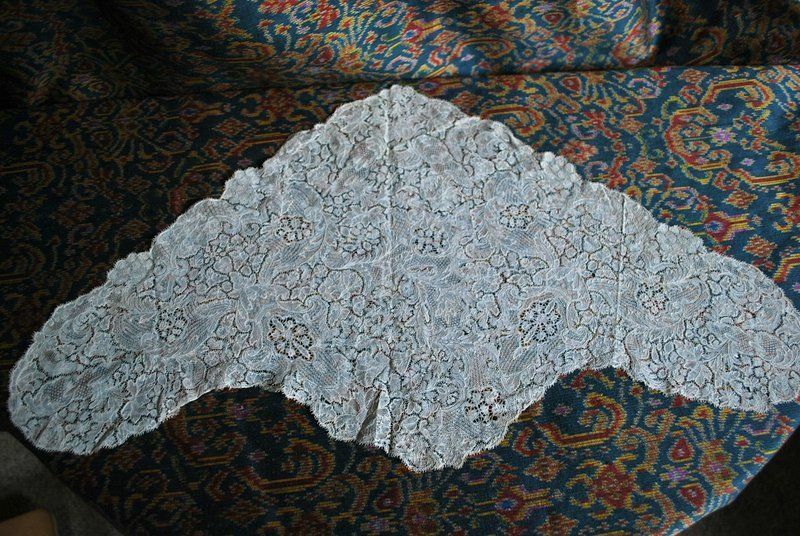 Comments: This piece is smaller than it looks – Brussels pieced bobbinlace with bride ground, around 1720-30, maybe a little earlier. Beautiful technique, and excellent snowflake, partridge eye and other geometric fillings. The motifs do have a Bizarre pattern feel. The piece has a left-right symmetry, but you can see a few small seams, so I’m calling it a well-done remade piece. The picoted edge is a 19th c addition. For a piece of this age you would expect a full capback/fill/lappet set for a headpiece, not something of this form. $493.00, 5 bidders, reserve not met. Comments: A long Brabant pieced flounce, with both the expected 6-pointed star and bride grounds. 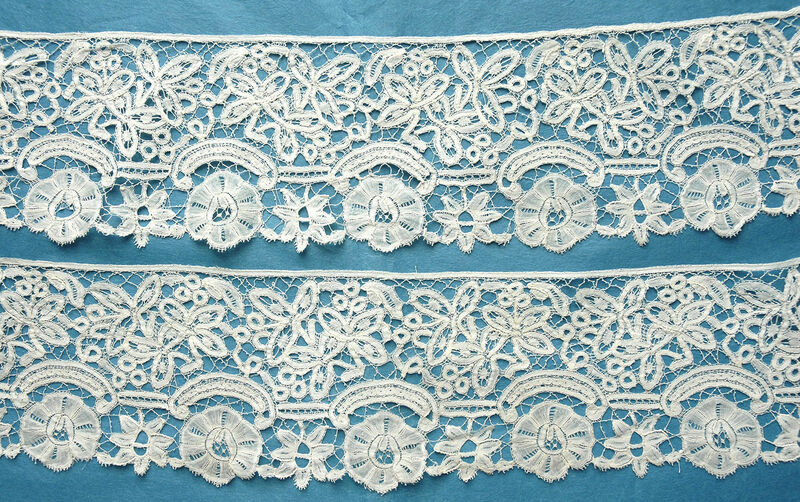 The motifs are loosely woven and of fairly large size and sometimes indeterminate shape – typical of this lace. Seller had another Brabant flounce last week, this is a different pattern. Soilage: Occasional isolated brown spot. Sold for $875.00, 5 bidders. 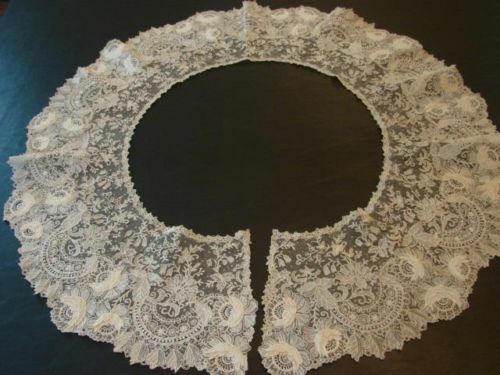 http://tinyurl.com/nr573ch 19THC IMPRESSIVE & RARE HAND WHITE CHANTILLY LACE WIDE FLOUNCE BRIDAL YARDAGE! 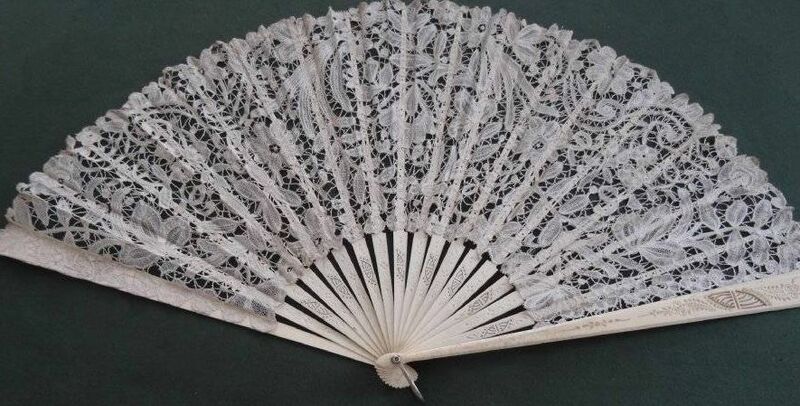 Comments: An impressive wide and long Point Ground white bobbinlace flounce, perhaps Chantilly. It has a little too much cloth stitch in the motifs with half stitch used more for shading. 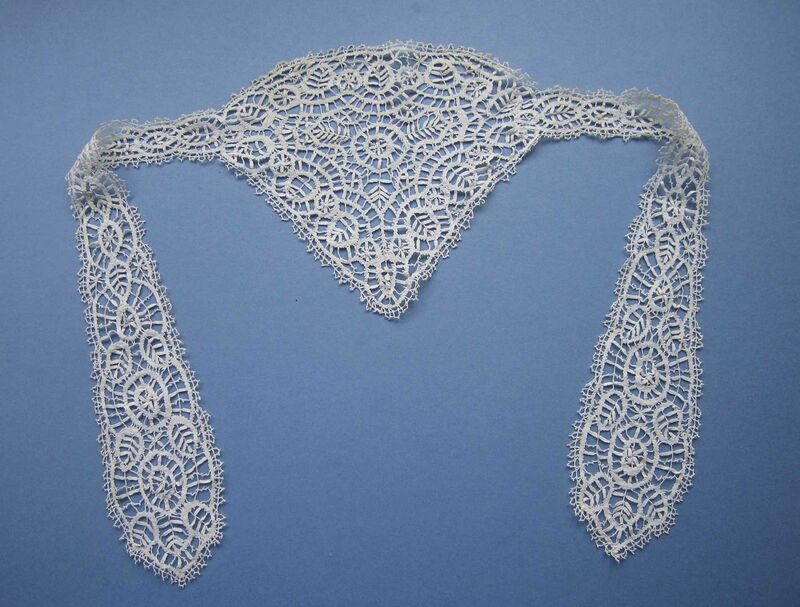 This is more typical of Bayeau, although this is not as heavy a lace as is often seen there. Extensive honeycomb fillings. The mesh is also a little streaky, which you sometimes see in linen Lille laces. So this one is a puzzle. I don’t see any obvious racroc lines, another puzzle. And we do know that a lot of white Chantilly was actually made in Belgium. This might have been a skirt flounce. Romantic floral design. Modifications: There is one photo of the ends, one looks finished, the other might be cut and finished. Hard to tell. Engrelure added. Damage: A few small holes in the mesh. Soilage: Looks clean, but there might be some faint isolated tan spots. Finish: I think there are some vertical fold spots. Sold for $1,200.00, 9 bidders. Comments: A handkerchief with a narrow Point de Gaze border. Double and triple raised petals in the roses. No picots on the outer edge, and a few decorative ‘mode’ fillings. Interesting, the more elaborate roses are on the sides rather than in the corners. Excellent design for a narrow border, well executed. 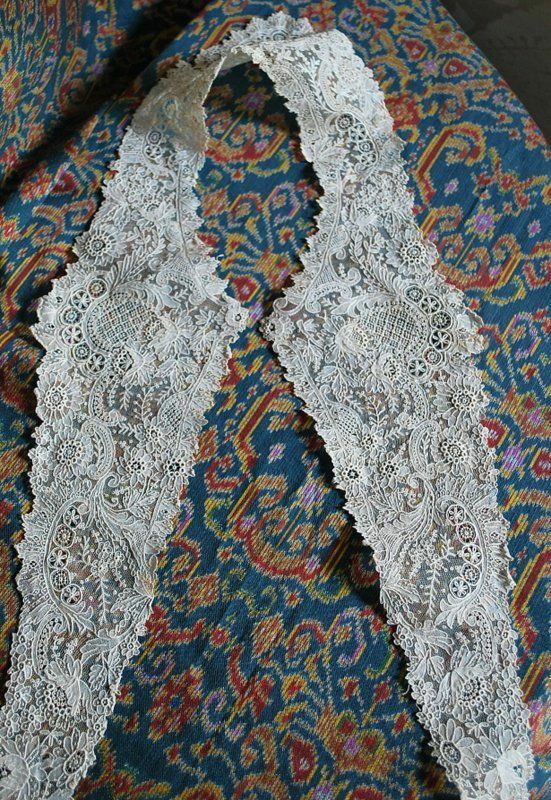 http://tinyurl.com/pgn7698 ANTIQUE AIRY & DREAMY CARRICKMACROSS APPLIQUE LACE YARDAGE! WEDDINGS! Comments: A wide, long, border of Carrickmacross applique on machine net. Note the typical looped picot edge, along with a few needle-made ring esprits. The pattern isn’t typically Irish, but is a good romantic floral design. Fillings are limited to needlerun in a few places. Modifications: Can’t see the ends to tell if they are cut. Top edge is not finished, but I dn’t think it has been cut. Finish: Horizontal and vertical fold creases, light wrinkling. $152.50, 8 bidders, reserve not met. 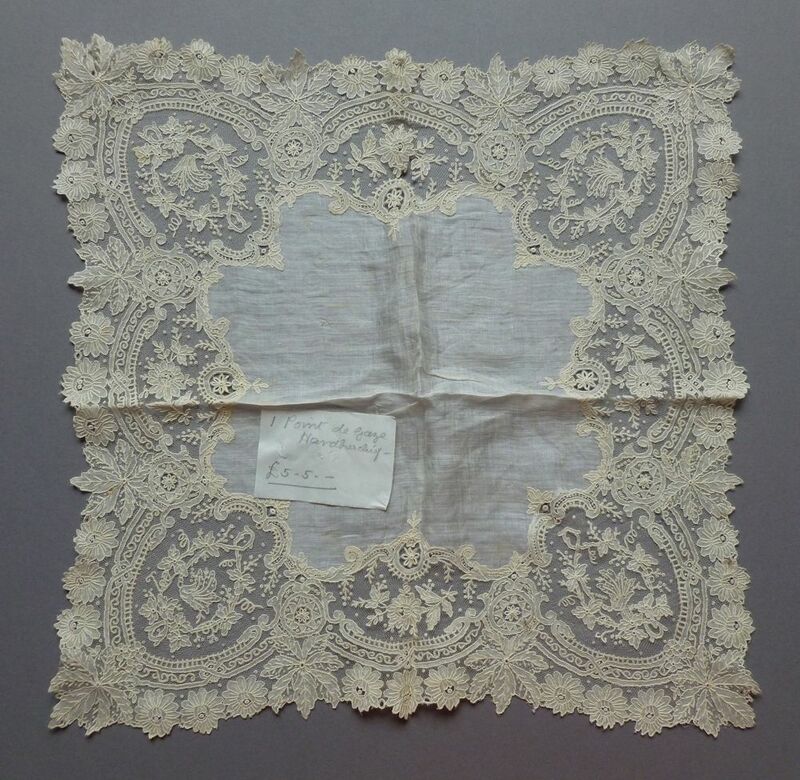 Comments: A Duchesse de Bruxelles handkerchief with raised petals in the Point de Gaze inserts. 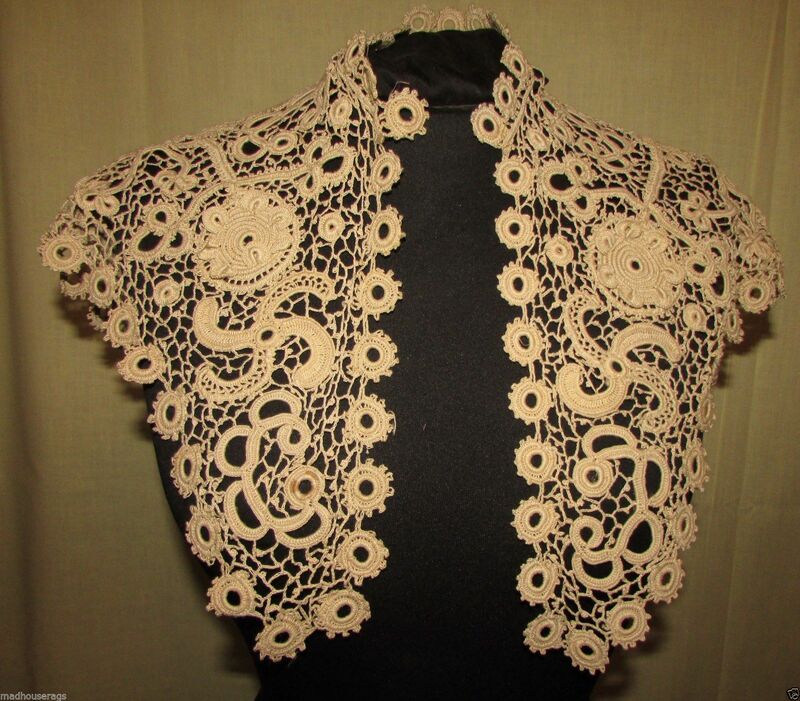 The bobbinlace is finely done with quite elaborate motifs. Good raised work on half-stitch ground. A few simple needle-made fillings in the bobbin flower centers. The elaborate design is a bit crowded especially along the sides of the piece. Damage: Nothing obvious from the photos. PtdeG mesh looks good. Finish: Horizontal and vertical fold creases, a little wrinkled. Sold for $207.50, 3 bidders. Size: ~46″ long, 5″ max width. Comments: A Point de Gaze collar with long lapels. The ‘raised’ elements in the roses actually look quite flat, or at least single layer. Note here the excellent decorative ‘mode’ fillings, especially the large grids of rings. For a romantic floral design, it’s a little crowded, ad some filling areas are a bit oversized. Damage: One small a a few pinholes in the mesh. Finish: Slight wrinkling, very minor. Sold for $127.00, 2 bidders. Comments: A Point de Gaze handkerchief, no raised work. There are a few decorative ‘mode’ fillings, and I especially like the long rows of rings outlining the cartouches. Simple floral designs in the cartouches, with quite a lot of solid work massed along the outer edges. Nicely sculpted inner border. Damage: Some small holes especially center bottom edge. Finish: Horizontal and vertical fold creases, center cloth puckered and wrinkled. Might have been replaced? Size: 40″ long, 4.5″ deep. Comments: A Gros Point border, mid 17th c. As with most Gros Point of this period, this piece has been assembled from a number of examples. I also say that there’s nothing you can’t learn about needlelace by studying a good piece of early Gros Point. 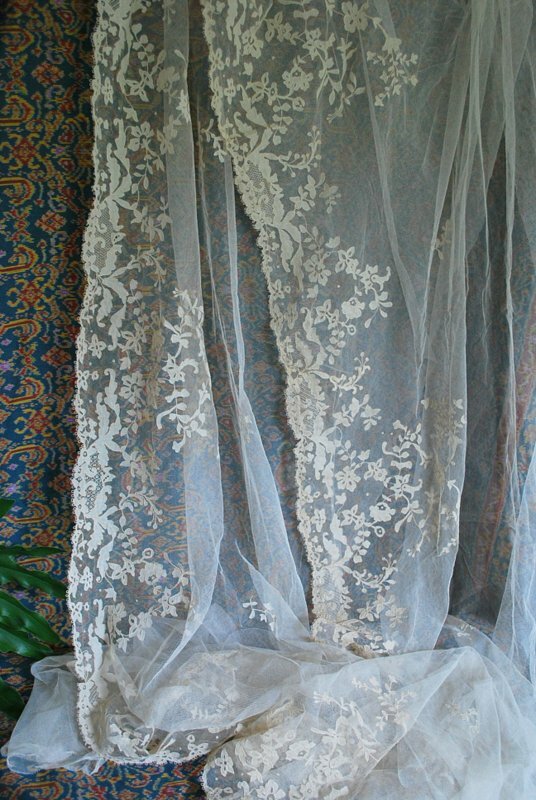 This one combines elements with well sculpted raised edges, elaborate picoted brides, and quite a variety of clothwork. The separated loops on the lower border are a feature found in early examples, although I don’t know if it is original.. The engrelure looks bobbin-made and was probably added later. Damage: Age wear, some repairs, a few bride replacements. Size: collar – 56″, 4″-5.5″ wide. cuffs – ~ 10″-11″ x 4.5″. Comments: A matching collar with long frontpieces and cuffs of Brussels Duchesse. No raised work in the Point de Gaze inserts, and no decorative ‘mode’ fillings. Not raised work in the bobbinlace either – just conventional fairly flat motifs. But the matching combination is rare. Soilage: Looks a little beige in some photos. Finish: 2 motifs folded over along back neckline in one spot. 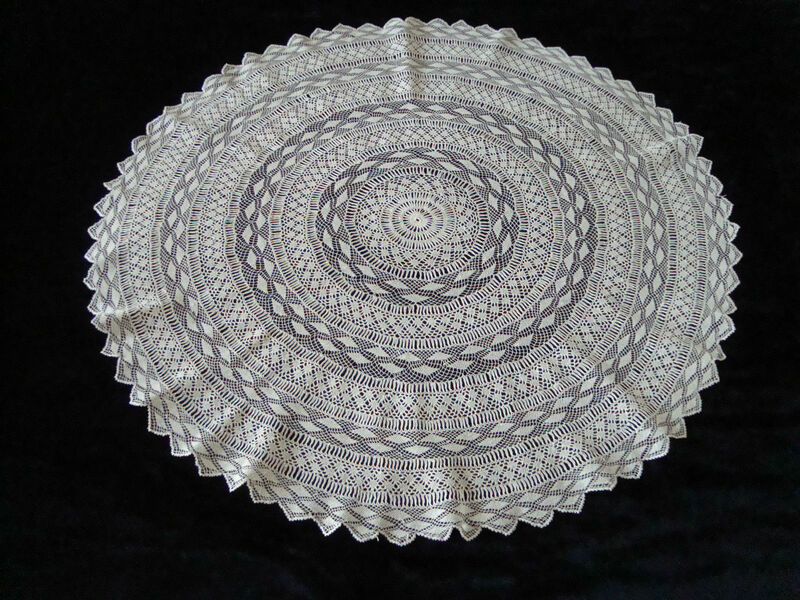 Comments: A round tablepiece of Armenian knotted needlelace. Typical geometric concentric design of diamond patterns. Could be a fairly new piece. Damage: Two tiny loose spots, looks like an unattached thread. Soilage: Seller says it has been freshly laundered, but gives no details on the process. Finish: No obvious creases or wrinkles – doesn’t like completely flat, but that’s not uncommon in pieces like this. Sold for 11.50 GBP, 2 bidders. 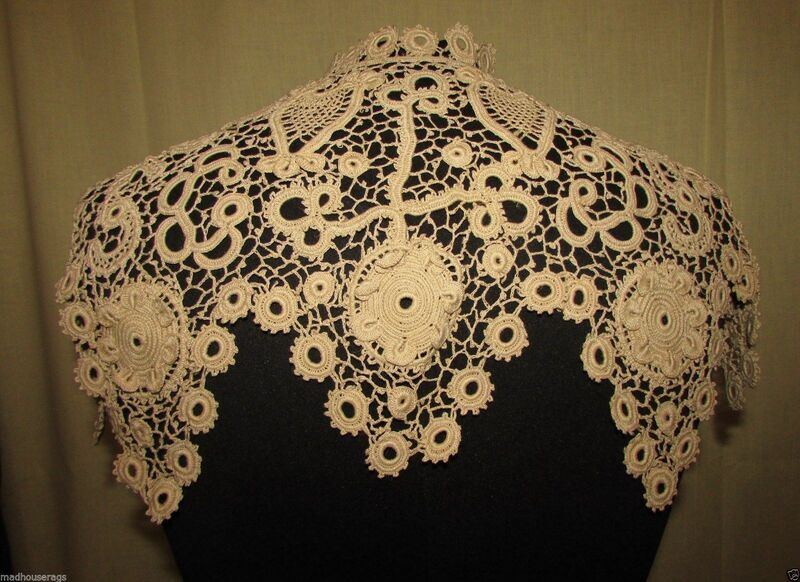 Comments: A shawl collar of silk Irish Crochet. The edge is composed of small circles, very typical in silk examples. Some raised elements in the motifs, which are rather large. Damage: a few loose threads, minor. Soilage: Occasional small red-brown spot. Comments: A pair of late 18th c Mechlin lappets. The picot border looks so precise that I think it is a later addition. Very thin and delicate motifs with minimal fillings. They are joined at the top, and the join is a little curious. It looks like motifs from another piece were cut out and appliqued onto the seam. They may not have been cut at the top, the length looks typical for this period. Provenance: From a Paris auction house. Modifications: Joined at the tops. Damage: A few pulls in the ground. Finish: Looks like one fold crease near the join. Overall condition is fine. Sold for 93.11 GBP, 3 bidders. Comments: A pair of 18th c Mechlin lappets, maybe 3rd quarter, maybe a little later. Delicate design with some elaborate filling stitches. The ovreall length is a little short, so I’m thinking they have been shortened at the tops. The picot border looks like a later addition. Damage: One small split and some pinholes in the gruond. Finish: A few fold creases and slight wrinkling. Sold for 96.50 GBP, 3 bidders. Size: 18″ across front – adult size. Comments: An Eastern European (Czech or Slovak) bonnet with gold thread embroidery and a silk bow at the back. 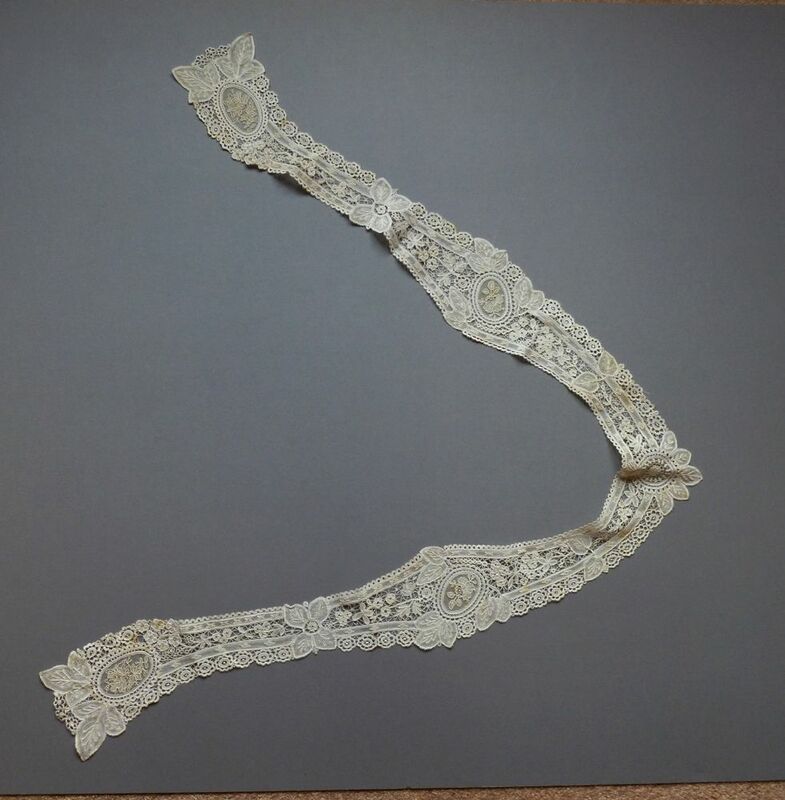 Tape lace incorporating gold thread and some tallies surrounds the rim and is inserted down the center of the piece, and across part of the back. And impressive and rare piece. Finish: Storage folds, and the ribbon is a little creased. Unsold as of 6/20/2015, 3:56 PM MDT. 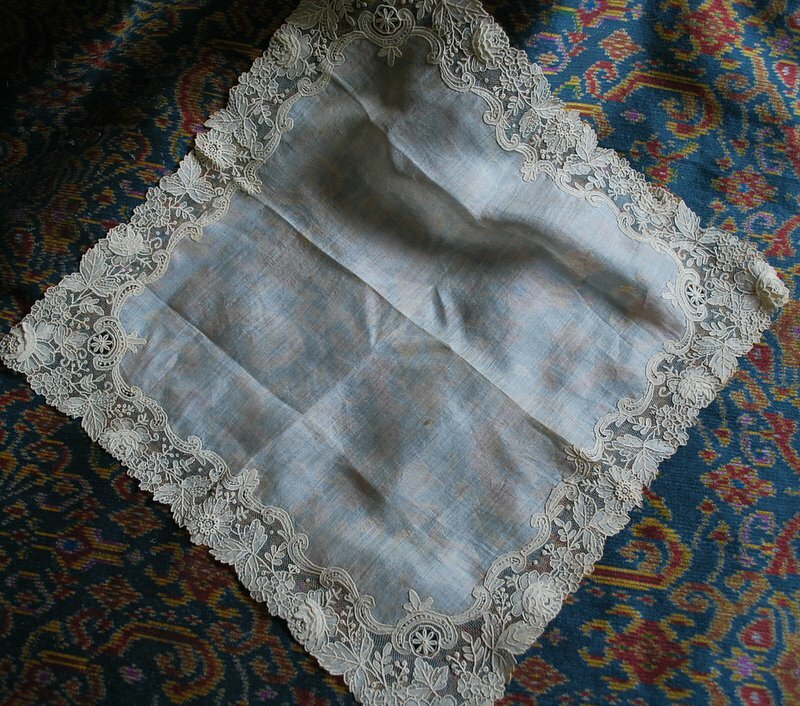 I would love the news on available lace wedding hankies!! !